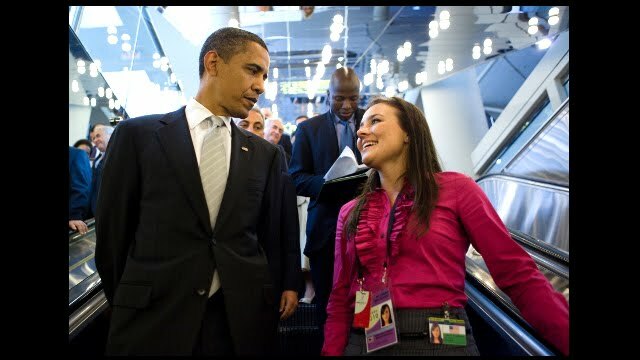 President Barack Obama and CLS Participant Lesley Dudden discuss her CLS program experience. 2009 U.S. Department of State Critical Language Scholarship (CLS) Program alumna Lesley Dudden studied Turkish in Alanya, Turkey. After she returned, Lesley was selected as a youth delegate to the G8/G20 Summit in Toronto, Canada. At the Summit she had the opportunity to tell President Obama about her CLS experience. On hearing about her CLS studies, President Obama introduced Lesley to Turkish Prime Minister Recep Tayyip Erdogan. Lesley writes, "Needless to say, my Turkish came in handy!" After completing her undergraduate degree in political science from Nebraska Wesleyan University this spring, Lesley will be an intern in the U.S. Department of State Office of Caucasus Affairs and Regional Conflicts. She will then continue her Turkish study at Boğaziçi University on a Boren Scholarship. "That is what has come into my life after my time with CLS," says Lesley, "I am thankful everyday for my experience and the opportunities it has opened up to me."